Crutches have been an inevitable part of my life in recent months, and the trend is set to continue for a while yet ... I've got my own elbow crutches, which I find more convenient and comfortable than a walking stick or 'normal' underarm crutches - you can at least do stuff with your hands without the blasted things falling over! Very handy when out shopping, or doing stuff in the kitchen. So these cosies double as awesome decoration, and quick identification (the right one has the purple section on it). The knitted fabric also helps them to stay put when leaning them against things - a bit more friction than a metal surface. Coming to the rescue - Missability's Walking Stick Cosy pattern! 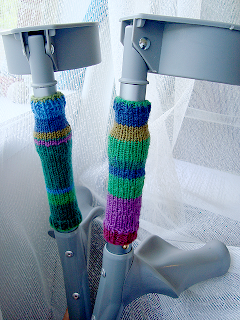 Because of the shape of my elbow crutches I had to knit a flat piece and sew it on (under the elbow cuff and above the hand rests). Actually, I tell a lie. I knitted them, and Dotter sewed them on, after throwing her hands up in horror and unpicking my pathetic attempts at invisible mattress stitch, LOL. She's much better at it than I am! I used Regia's Kaffe Fasset sock yarn, gorgeous colours! NB : The cosies will generally sit lower than you're expecting. My first cosies ended up being way too short, and even these second ones, which I really thought would be long enough, still sort of scrunch up and sit shorter than I'd like. So if in doubt, knit a bit more! And isn't this pink fuchsia gorgeous? Fuchsias are one of the few flowers I seem to be able to grow - but I've only ever had the 'classic' coloured one. Bunnings got in this batch of pink ones last week - yummy! such a nifty idea. I can comfortably say I hope I never have cause to knit this pattern! 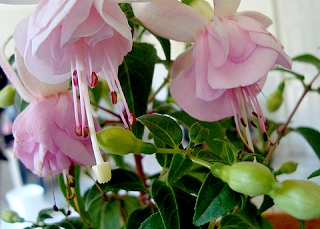 Fuschia's are gorgeous and those ones are so delicate. You have the best dressed crutches I have ever seen!! Clever idea. I would have just written R or L on them in magic marker. 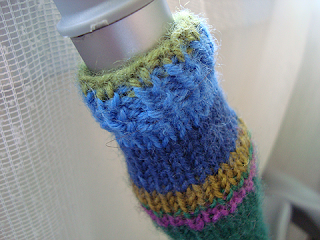 Leave it to you to find a knitterly way to enhance your sticks. Bravo! I love fuchsias! When I was very little, my mom taught me how to pop the tight buds. Why do I never buy myself a fuchsia basket in the spring? Would you like a date?